Wow, what a difference a few months can make. The volcano, named Krakatau, has reached its incredible 200-feet-high goal and it can be seen for miles around. 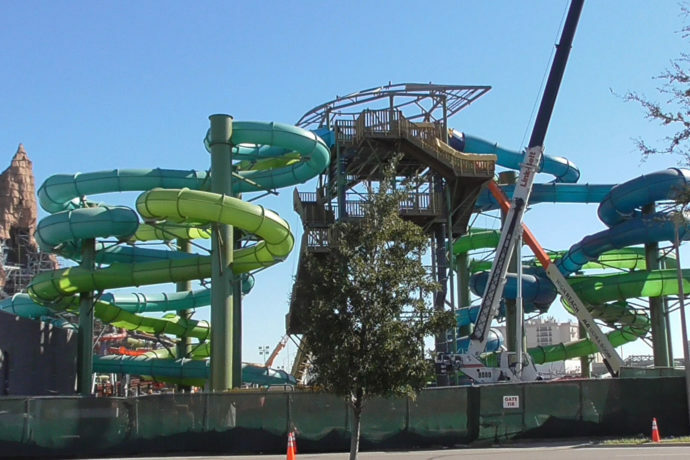 Around the open backside we can get a good view of many of the main attractions for Volcano Bay, including the highly anticipated water coaster, named Krakatau Aqua Coaster. The water coaster will use 4-person canoes as its ride vehicles taking riders throughout the volcano before plunging through a waterfall at the end. I cannot wait! In addition to the volcano, work is moving on to the park entrance, pedestrian tunnel (that leads to Tram drop-off,) and of course the two Cabana Bay expansion towers that border the new water park. The views from those rooms’ windows of a towering volcano are going to be impressive. Check out the update video as well as snapshots and more details below. And stay tuned for a Universal Studios update coming soon! Slides are butted right up against Turkey Lake Rd.